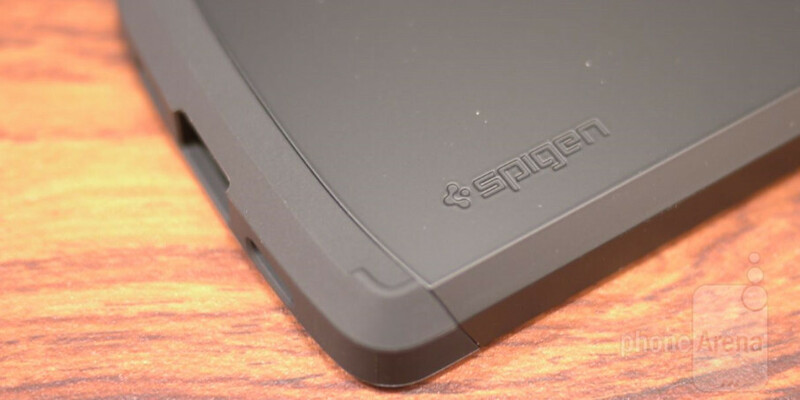 Following in tradition, the Spigen Google Nexus 5 Slim Armor case is a sturdy protective case that features a double layered design. Form fitting without adding a considerable amount of bulk, there’s a TPU inner case that absorbs shocks in the event it’s dropped, and a polycarbonate midsection piece that further strengthens the integrity of the entire frame of the case. Thankfully, Spigen offers the case in four distinct colors that seem to be oh-so popular these days – smooth black, infinity white, champagne gold, and bright red. Putting on the case is pretty simple, since the TPU inner case easily wraps around to give it a snug fit. Afterwards, the only thing left to do is snap on the polycarbonate midsection piece. All of the handset’s and ports are easily accessed with the Slim Armor case on, even the 3.5mm headset jack because the opening is wide enough to accommodate those fatter jacks. Holding it is still pleasant enough on our hands, though, its angled edges have a sharp feel to the touch. Rather than picking up the official Bumper Case for the phone, which sells for $35.00, Spigen’s Slim Armor case for the Nexus 5 plays to its strength by sporting a lower $25.00 cost. The $10 in savings you get is something we certainly think you’ll be happy about. If you’re looking for a decent protective case that has a stylish element to it, while also being affordable, then this is an option that you’ll want to keep in contention. wow..someone is desperate to write about something...just..something.. I may be getting this case. I was curious if the red one was the same color red as the red nexus? Also, how much more bulk does it add to the phone? My Nexus 5 is naked but, looking at the pictures, it doesn't seem to add much bulk to the height and width but from the side it looks almost twice as deep as a naked Nexus. Spigen doesn't show any dimensions on their website. I have this exact case for my N5. Picked up the Spigen case for $15 on Amazon. Has a nice premium feel and look. I have the white, so I have no idea about the red, although the case will cover everything except the screen, so I dont know if that matters that much. The case does add a bit of bulk, you can certainly feel the difference. But it does feel good in the hand, feels very protected. The only thing I did not like was the button coverings. The power button can be kind of hard to press, but you get used to it. Ultimately I put it aside for the Caseology Carbon Fiber Case I got on Amazon, all the buttons are open and adds just the right amount of bulk/protection IMO. Thanks. Normally I wouldn't care too much about aesthetics but I really like the color and feel of the naked phone, so I wanted to try and preserve that as much as possible. For those reasons I don't think the Caseology would work for me. I saw Spigen has another, ultra hybrid transparent case, although people report problems with the case scratching after a few weeks. It hardle adds any bulk at all. I have this case for my Note 3 and love it!! If I lost my phone and had to buy another case I would buy this case again. Mine is the black and white which I think looks really sharp. I use a slim armor on my Note 3. It's a really good case. I actually like the sharp edges, I think it makes the phone feel industrial or something lol. I'd say it's just about perfect as far as protection vs bulk. Combined with a tempered glass screen protector, I'm confident it would survive just about any fall I may give it. Thumbs up for slim armor. Same here. Mine has survived a few falls. The worst fall landed on the back corner where the rubber is. Phone is fine, and there is just a tiny scratch in the rubber that you can only see if look for it. R u kidding me,? Only 7.5 for this spigen cover. This is probably one of the best covers. The quality and sturdiness and feel of this cover is just amazing. I agree. If I bought a second phone I would by this case again. It's not flimsy and I love that the rubber doesn't stretch and start to seperate from the phone.